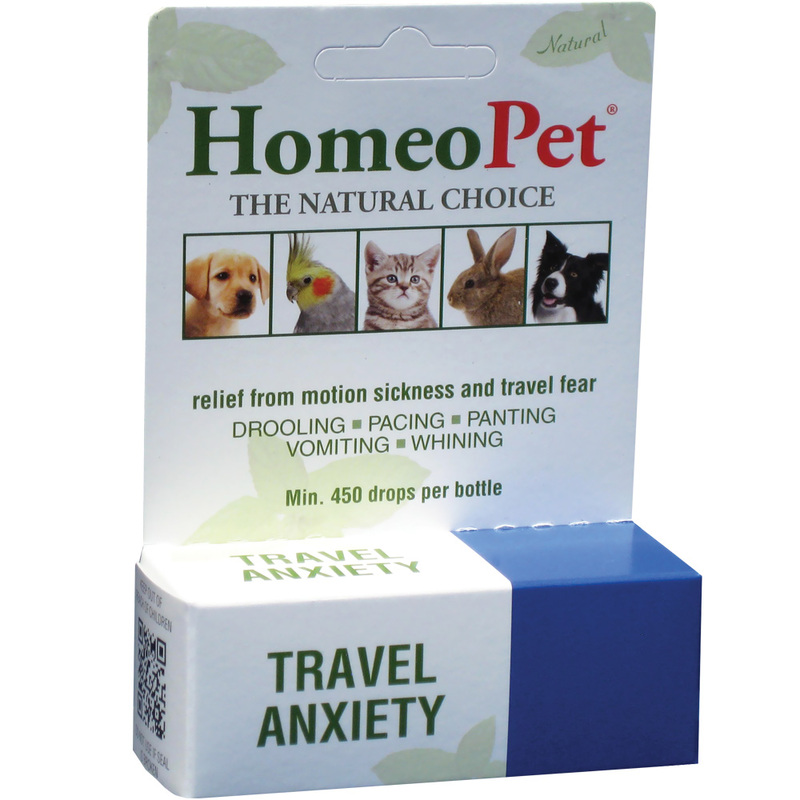 HomeoPet Travel Anxiety Give your furry pal a moment of Zen with the HomeoPet Travel Anxiety Relief Dog, Cat, Bird & Small Animal Supplement. Because sometimes your pet has trouble just taking a deep breath, this homeopathic liquid helps to promote a sense of calmness. Drawing on hundreds of years of natural medicine therapy, the all-natural ingredients work to synergistically relieve anxiety in a variety of stressful travel situations. Whether your pet suffers from motion sickness, fear of the car, or uneasiness during flying, the drops quickly help to eliminate cowering, trembling, nausea, pooping, destructive behaviors, and other common symptoms of stress and anxiety. FDA-registered homeopathic travel anxiety drops are clinically proven to promote a sense of calmness in dogs, cats, birds, and small animals. Use for pets with motion sickness, or who have a fear of traveling including cars, boats, trains, and airplanes. Helps to relieve barking, whining, pacing, panting, cowering, trembling, drooling, nausea, destructive behavior, and more. The best place for a pet to travel is in the front passenger car well as this is the part of the car that moves the least - the pet should be kept from looking out of the car as much of the stimulus for travel sickness is visual - the air vents should be turned to open and cool and the radio should be turned to a soothing music or talk show. In the case of dogs, they are best tied doen to the frame of the deat by their leash so they cannot get up and look out. Other things that can help are very short journeys (1 telegraph pole to another is more than enough to get started, followed by a reward such as a walk with a treat). Some dogs are better left unfed before a journey, while others are better with a little food. It is extremely rare for a big meal to benefit and takes a lot of cleaning up should it come up. Chemical sedation can also be used alongside HomeoPet Anxiety, bt it should be possible to use much reduced doses to give the same level of anxiety reduction, consequently with reduced side effects and can, in many cases, be done without completely. Can be used on its own or combined with HomeoPet First Aid for vertigo from injury.